I took Latin in high school. It was part of my master plan to start with Latin, as the basis for learning several of the Romance languages. You know — Italian, French, Spanish… because I would use all of those someday. Because at age 14, everything seemed possible and there was so much time coming down the pike that throwing in a few extra languages should not be a problem as I launched my brilliant career. It’s only been a little over thirty years, and I have not gotten around to that little romance language project yet, but no worries. I still have the podcast Italian language course on my ipod, and if I get right on that, I’ll be caught up in no time. But, back to Latin. Sure, it was considered a “dead language”. It did not have any applicability to what would turn out to be a career in marketing management and the food industry, which made Latin a nonsensical curriculum choice in the 1980’s. But at the time, it represented endless possibilities. Here we are decades later, and the trip to Rome brought me back to those Latin classes over and over. Not that I could read most of the Latin inscriptions on the monuments and the art. My conversational Latin had been limited to phrases such as “The girl is standing by the aqueduct”, which does not come up much. Because we did not go see the aqueduct. Otherwise I would have been set. We did see the Tiber River, and that always figured prominently in the lessons: “Romulus and Remus sat by the Tiber River…”, that kind of thing. 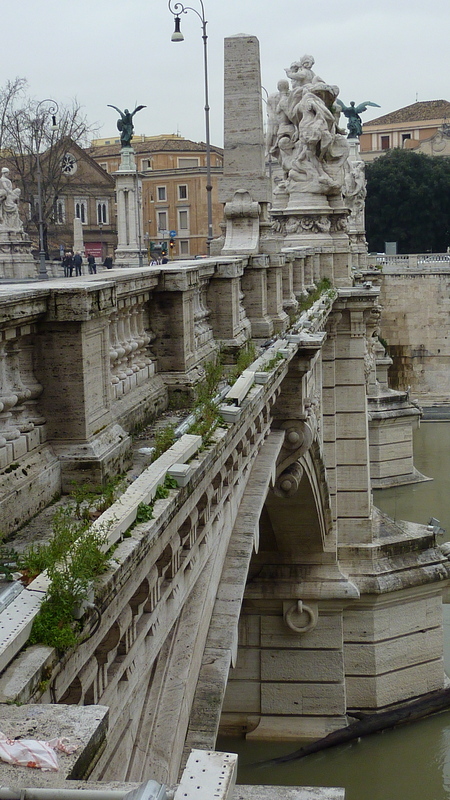 The Tiber looked just as I had pictured. A no-nonsense kind of river. That’s why I took a picture of a bridge instead of the brown water. And this little guy has been watching over the river since before high school Latin classes were invented. 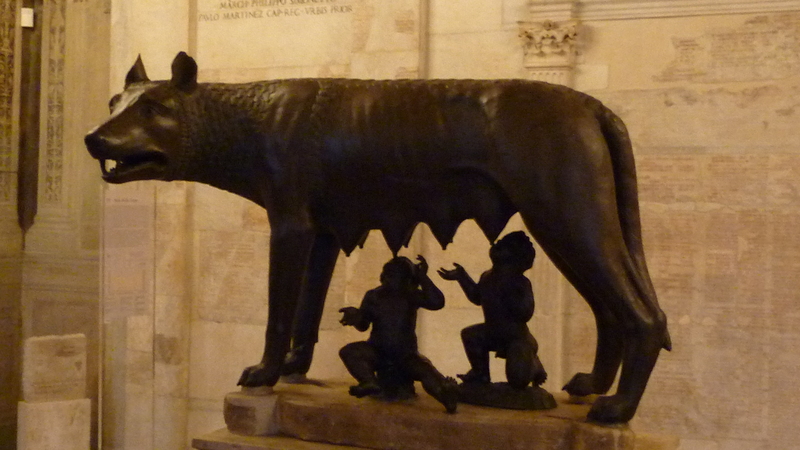 Romulus and Remus are popular figures in the art and lore of Rome. Their likenesses grace many postcards and are sold at most souvenir stands, along with their “mother”. According to Roman mythology, they are the traditional founders of Rome. In addition, they hold the distinction of being “pre-eminent among the famous feral children in mythology and fiction”, or so says wikipedia. And that is saying something, because those feral children can get quite famous. Which all just serves to remind me that when they say truth is stranger than fiction? Sometimes it is true, but not always. And the Latin? It turns out it is not dead yet. More on that later. LATIN classes….I took latin classes in high school and the only thing I remember besides the stories of Hercules was conjugating verbs. I still remember ero, eras era, eramos, eratis, erunt or something like that. Great photos. Isn’t traveling wonderful? Love the thoughts and thanks for taking back down memory lane. PDitty, good to have you on board. Your poem is going to stir controversies from the ardent Latin lovers who have been writing in. Wait, they are not Latin lovers, they are lovers of the Latin language… that did not come out right. Speaking of travel — there’s travel, and then there is TRAVEL. Can’t wait to hear more of your stories! I met you briefly while sitting in the Basilica San Clemente a few weeks ago. Then, Jack and I ran into Cara and Dan on the train ride south to Naples…on the day you were supposed to be flying home. Anyway, Cara forwarded your blog info to me and I’m so happy she did. 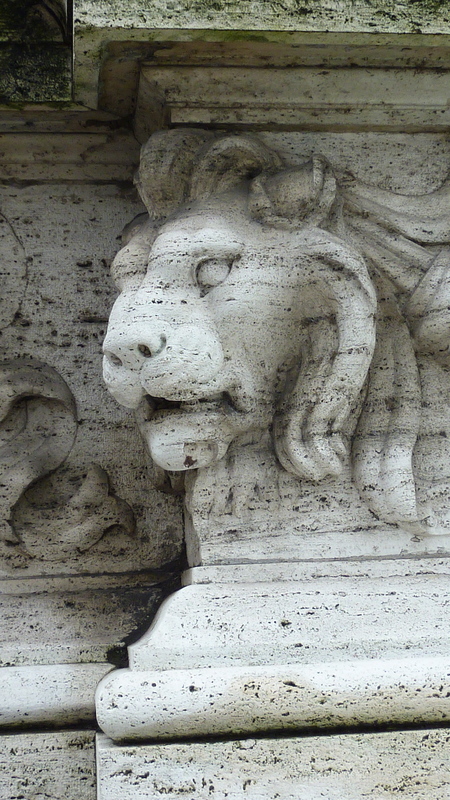 Your photos are beautiful and I have enjoyed reading your impressions of Rome. I’m always learning more about this place and find others’ impressions so interesting. I also wanted to say that your previous blog with the harmonica player, Buddy somebody, is just incredible. Thank you so much for posting it. In fact, I am going to link him on my own blog. I think everyone should see that guy go. Beautiful pics, Jane. The water is the same color as my hometown’s river, The Vermilion. LOL! When I think of high school language classes, I think of how my French teacher spent her class budget my senior year. She bought a mannequin and made each of us come up in front of the class to converse with it. Not that it had the capability to talk back to us, mind you. So if you take a bunch of insecure high school kids and make them talk in front of everyone else to an inanimate object… Let’s just say it wasn’t a popular class activity. And then in college I spent a summer going “back to my roots” and trying to learn my father’s native language, Icelandic. When I ran into my college French teacher the next semester before classes started, I found myself speaking to her in a weird combination of Icelandic and French. Verbs in Icelandic, nouns in French. She didn’t seem too impressed. Probably because she didn’t speak Icelandic. And that was the end of my attempts to become multilingual!